In 1968 the motoring world was taken aback by the Jaguar XJ6 with it's ground breaking new technology low profile tire ER/70VR15. This XJ6 tire size is now called a 205/70VR15, which is easier to understand. 205 meaning 205mm wide, 70 meaning 70% of 205 (144mm) is the height of the side wall. V meaning a speed rating of 149mph. R standing for radial, and 15 being the diameter of the rim in inches. Out of the XJ6 tires available today Pirelli make the 205/70VR15 Pirelli Cinturato CN12. This XJ6 tire is of the highest specification with it's a W rating (170mph). It is easily capable of the speed of an XJ6 or XJ12 for that matter. 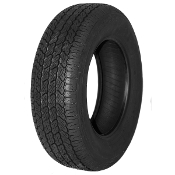 It is also extremely good value for such a high performance tire made by one of the worlds best tire manufacturers.